SEOUL, South Korea (AP) — Lee Soo-nam was 8 the last time he saw his older brother. Sixty-eight years ago this month the boy watched, bewildered, as his 18-year-old brother left their home in Seoul to escape invading North Korean soldiers who were conscripting young men just weeks after invading South Korea to start the Korean War. An hour later, his brother, Ri Jong Song, was snatched up by North Korean soldiers near a bridge across Seoul's Han River. Lee always assumed Ri died during the three-year war that killed and injured millions before a cease-fire in 1953, but his mother prayed daily for her lost son's return, giving up only a few years before her death in 1975. But Ri survived the war, living in North Korea. 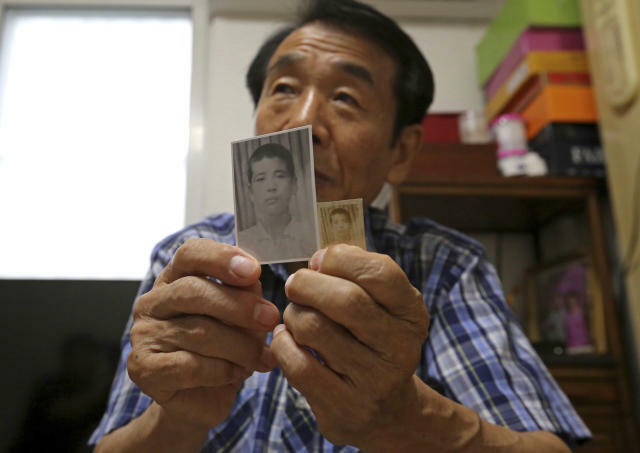 The brothers, now 76 and 86, will be among hundreds of Koreans who will participate, starting Monday, in a week of temporary reunions of divided families. Many have had no contact with each other since the war cemented the division of the Korean Peninsula into the North and South. The elderly relatives gathering at North Korea's scenic Diamond Mountain resort know that, given the fickle nature of ties between the rival Koreas, this could be the last time they see each other before they die. "I'm nervous. I'm still unsure whether this is a dream or reality. I just want to thank him for staying alive all these years," Lee said in an interview in his home in Seoul, not far from where he last saw his brother. Since the end of the war, both Koreas have banned ordinary citizens from visiting relatives on the other side of the border or contacting them without permission. Nearly 20,000 people have participated in 20 rounds of face-to-face reunions since 2000. No one has had a second chance to see their relatives. This week's reunions come after a three-year hiatus during which North Korea tested three nuclear weapons and multiple missiles that demonstrated the potential of striking the continental United States. At past meetings, elderly relatives — some relying on wheelchairs or walking sticks — have wept, hugged and caressed each other in a rush of emotions. According to Seoul's Unification Ministry, which handles inter-Korean affairs, more than 500 separated South Koreans and their family members will cross the border for two separate rounds of reunions between Aug. 20 and 26. At Diamond Mountain, Lee expects to meet Ri and his 79-year-old North Korean wife and 50-year-old son. Lee will bring more than a dozen family photos, including a black-and-white picture of Ri in a buzz-cut when he was 16 or 17. "That's how I remember him," Lee said. "I lost a brother and my parents lost a child, but my brother lost his parents, siblings, friends and an entire hometown, and he probably spent his whole life longing for all of those things. It's heartbreaking to think about." The difference in the siblings' family names is a product of the Korean Peninsula's division — each country uses different English transliteration rules, so Lee in the South is spelled Ri in the North. Many of the South Korean participants in the reunions will be war refugees who were born in North Korea. Kim Kwang-ho, 79, was among some 14,000 refugees who were ferried to South Korea by the American freighter SS Meredith Victory in December 1950 in one of the world's largest humanitarian operations. Also on the ship were the parents of current South Korean President Moon Jae-in, who described the evacuation as a "voyage of freedom and human rights" in a speech in Washington last year. At the reunions, Kim expects to meet his 78-year-old brother, Kim Kwang Il, and his sister-in-law. Kim has vivid memories of what he described as a beautiful hometown in northern North Korea, where he plowed rice and corn fields with cattle, picked peaches and apricots from trees and spent hours swimming in brooks. He gets emotional when talking about the mother he left behind, who used to cry over the death of his brother during the war. "I have clear memories of events that happened," Kim said. "But somehow I can't remember the faces of my mother and brother." Behind the raw emotions, the meetings are tightly coordinated events where participants are closely watched by North Korean officials and dozens of South Korean journalists. As in previous reunions, South Korea's Red Cross, which organizes the events with its North Korean counterpart, has issued a guidebook telling South Koreans what to do and what not to do. "Political comments such as criticism of the North's leadership and the state of its economy could put your (North Korean) family members into a difficult situation," the green book says. "If a North Korean family member sings a propaganda song or makes a political comment, restrain them appropriately by naturally changing the subject of the conversation." Lee knows he won't be able to talk much about what happened when his brother was taken in August 1950. Instead, he plans to share childhood memories, such as when Ri took his younger brothers on a hike on nearby Mount Nam to look at foxes living near an old fortress wall. South Koreans also can't give their North Korean relatives luxury items because of international sanctions imposed on the North over its nuclear and missile programs, with past cash gifts banned this year to reflect the sanctions, according to a South Korean Red Cross official who didn't want to be identified, citing office rules. The reunions are occurring during a flurry of diplomatic contacts. In recent months, North Korean leader Kim Jong Un has met Moon twice and held a summit with President Donald Trump in Singapore, where they issued a vague goal of a nuclear-free peninsula, without describing how and when it would occur. Moon, who plans to meet Kim again in September in Pyongyang, North Korea's capital, says progress in inter-Korean reconciliation will be a crucial part of international efforts to resolve the nuclear standoff with the North. The Koreas have held military talks and are fielding combined teams at the ongoing Asian Games in Indonesia in a gesture of goodwill. Still, South Korea has failed to persuade the North to accept its long-standing proposal for more frequent reunions with more participants. North Korea has also ignored the South's suggestion of hometown visits and letter exchanges. The limited number of reunions cannot meet the demands of divided family members, who are now mostly in their 80s and 90s, South Korean officials say. More than 75,000 of the 132,000 South Koreans who have applied to participate in reunions have died, according to government figures. Analysts say North Korea sees the reunions as an important bargaining chip with the South, and doesn't want them expanded because they give its people better awareness of the outside world. While South Korea uses a computerized lottery to pick participants for the reunions, North Korea is believed to choose based on loyalty to its authoritarian leadership. "When we meet this time, that will be the end for me," said Yoon Heung-kyu, a 91-year-old Korean War veteran from the South and a staunch anti-communist campaigner in his youth who will be meeting his North Korean brother-in-law and grandnephew. "North Korea guards against exposing its people to the free South because of fear of a regime collapse. It just allows 100 or so participants every several years to save face internationally," Yoon said. "These aren't really family reunions; if they were, we would be meeting in our hometowns, not at Diamond Mountain."